I have one of those 5 gallon glass pitchers with a spigot on the bottom, used to serve large quantities of beverage. It was a gift from my Aunt Nancy (as was this recipe) and over the years has become one of my favorite kitchewares. I have hosted countless events with it, from bridal showers to bonfires, and it has never done me wrong. Until yesterday, Thanksgiving. I filled 2 small rubbermade pitchers with Cranberry Sangria and the big glass pitcher with smooth, creamy, delicious Pumpkin Punch. Jimmy and I loaded them in his truck and set out on a leisurely drive to Shamong, NJ for Thanksgiving dinner with his side of the family. About an hour later we arrived, parked, and went to collect the alcoholic beverages before heading inside. I grabbed the Sangria and Jimmy went around to the back of the truck for the punch, he opened the hatch and yelled, “What the &%$#?” Apparently, the spigot at the bottom of the pitcher turned from “off” to “on” in route and half of the 5 gallon vat of punch poured out all over the inside of his truck. It was a MESS, to say the least. There was smooth, creamy, delicious Pumpkin Punch everywhere! Eventually, 1 hour… 457,238 paper towels… and a whole lot of F-words later the disaster was cleaned and we finally went inside and enjoyed an amazing meal with good company. A moist, juicy, perfectly browned turkey surrounded by all the fixin’s- stuffing, mashed potatoes, sweet potatoes with marshmallows, green bean casserole, broccoli and cauliflower au gratin, cranberry sauce, and pies galore. Nothing beats Thanksgiving dinner. We ate, drank, and spent time with family. Life was good. We ended up staying to be the last ones there and when it was finally time to head home we looked over with dread towards our pitchers. The Cranberry Sangrias were both empty and there was about a liter left of the Pumpkin Punch. Despite the agony of it’s spillage, the punch was really good and we couldn’t bear to throw away the remnants. After all, there’s no reason to waste perfectly good alcohol! We decided to play it safe, so we transferred what was left of the Pumpkin Punch to one of the rubbermade pitchers which tightly seals at the top with a tupperware-type lid. How could we go wrong? Well, one of the ingredients in the punch is gingerale and on the way home the carbonation blew the lid off and once again we arrived to find the orange liquid re-split all over the inside of the truck. 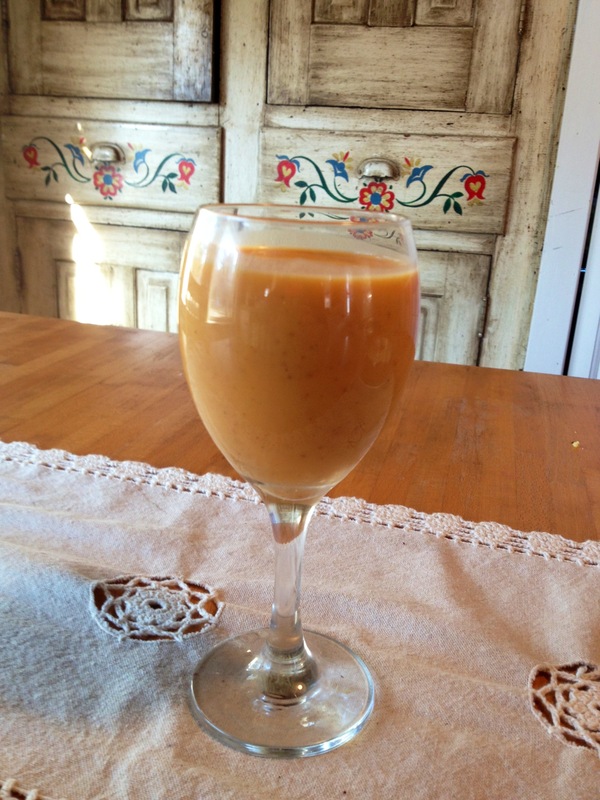 Smooth, creamy, delicious Pumpkin Punch…. Jimmy freaked out. I went inside and ate a leftover turkey leg. But, this morning we woke up very thankful to still be married. Put a few cinnamon sticks in a bottle of rum and let them infuse for at least 24 hours. Mix the rum, pumpkin puree, and sweetened condensed milk together in a pitcher or punch bowl. Before serving mix in the gingerale or cream soda. Sprinkle cinnamon on top. Serve chilled or over ice.